There are many different menu options in the CCR Cartridge filter. So what are they all? Some are fairly self explanatory (eg Cricut Lite) but here's what you'll find in each of those categories. My Cartridges: The My cartridges library will contain any cartridges that you have physically linked to your Cricut account using CCR, any digital cartridges you have purchased from Cricut.com and the "Cut it for free" cartridges that Cricut.com release weekly. Those free cartridges change each week. When the new free cartridges is added, the old one is generally removed. Now that the Gypsy Link process has been released the cartridges that are linked to your Gypsy will also appear in the My Cartridges library. You will first need to run the Link Gypsy program from the Options menu in CCR. All Cartridges: Every available cartridge including the Digital cartridges are found in this library. 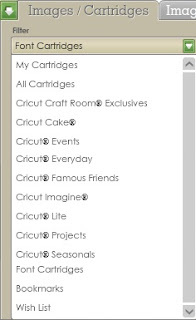 If you don't see any of the Imagine cartridges check the "Show Cricut Imagine cartridges" below the Cartridge filter list. Cricut Craft Room Exclusives: This will contain all the CCR exclusive Digital cartridges. Digital versions of the regular cartridges won't be found here. They will be found in All Cartridges. Most of the cartridges in this library can also be linked to your Gypsy. However there are some exceptions eg. the single images. Update your Gypsy and check the All Cartridges library. If a cartridge doesn't appear in the All Cartridges library then it can't be linked to the Gypsy. Cricut Cake: This library contains the Martha Stewart Cake cartridges and the Cricut Cake cartridges. Cricut Events: This library contains any cartridge that has been branded an Event cartridge. Eg. Baby Shower and Bridal Shower. Look for the Events label on the cartridge. Cricut Everyday: This library contains the majority of the Cricut cartriges. Anything that doesn't fit into any of the other categories will be found here. Cricut Famous Friends: Here you'll find cartridges from Close To My Heart, Creative Memories, DC Comics, Disney, Disney/Pixar, Nickelodeon, Sanrio and Sesame Street. Cricut Imagine: Yes.... you'll find all the Imagine cartridges here! Cricut Lite: Here you'll find all the exclusive to Walmart and Cricut.com Lite cartridges. Cricut Projects: Any carts branded as Project carts will be found here. Carts such as Giant Flowers and Frame of Mind. Cricut Seasonals: If you're looking for something for Christmas, Easter, Thanksgiving, Halloween, Spring, Summer etc you'll probably find it here. Font Cartridges: Any cartridge that Cricut have identified as having a font on it will be found here. Bookmarks: Here you will find any cartridges that you have bookmarked. Bookmarking is different to Linking. Bookmarking is merely a convenient way of identifying which carts you own. If you haven't Linked those carts you will still need to insert them into the Cricut if you wish to cut from them. To Add a bookmark scroll through the list of cartridges and click the green Add button beside the cartridge name. To remove a bookmark scroll through the list of cartridges and click the brown Remove button beside the cartridge name. When you have finished click the Continue button and you'll be returned to the main CCR screen. Your newly bookmarked cartridges will now appear in the Bookmarks filter. Wish List: Got a hankering for some new cartridges but aren't ready to purchase them? You can add them to a Wish list so you don't forget. Select Wish List from the Cartridge filter then click the Edit Wish List button. To remove a cartridge from the Wish List scroll through the list of cartridges and click the brown Remove button beside the cartridge name. If you would like to print your Wish List click the Print Wish List button and select your printer. And that's all I got to say 'bout that! Hi Narelle....hope you can help. I have bought digital images, Synced my gypsy, the images do not link to my gypsy. They do appear in All carts, like you said above. I have been through the trouble shooting with no luck! I know you can't do gypsy to craft room yet. Just want to do it the other way. Please help. My email is t.elementz@gmail.com hope to hear from you. I live in Brisbane too. How can I purchase creative memories digital downloads for my cricut. Hi Tammy. The Creative Memories cartridges aren't available digitally unfortunately. I really don't know the reason. The same applies to all the other licensed cartridges... Hello Kitty, Disney, Close to my Heart etc.